August 23, 2017 – The world’s most powerful particle accelerator, the Large Hadron Collider (LHC), began running at CERN, the European Organization for Nuclear Research, in 2009. The LHC spends most of its time studying the puzzles of high-energy physics. But for one month a year, it, like the Relativistic Heavy Ion Collider (RHIC) at the U.S. Department of Energy’s (DOE’s) Brookhaven National Laboratory in New York, studies the nuclear physics of the early universe by colliding heavy, charged nuclei (ions). As first demonstrated at RHIC, tiny samples of the quark–gluon plasma (QGP), the matter that permeated the entire universe in its infancy, are produced in high-energy, heavy-ion collisions. The heavy-ion program at the LHC subsequently confirmed RHIC’s discovery of the QGP and now enables the study of the QGP from vastly different initial conditions than those produced at RHIC. Thus, the results from LHC complement the U.S.-based RHIC program by allowing scientists to study this unique state of matter under the widest possible range of conditions. An experiment at the LHC is dedicated to the study of heavy-ion collisions. Called ALICE, it is the only experiment there dedicated entirely to the study of the nuclear physics of the QGP. ALICE stands for “A Large Ion Collider Experiment.” Its aim is spotting the high-energy, elementary particles, like electrons and gamma rays, streaming from the QGP, to explore the physics of the early universe. Funded by 58 agencies worldwide, including the DOE Office of Science, ALICE connects approximately 1,800 researchers from 174 institutes in 42 countries. They depend on the dozen instruments that constitute ALICE, including an electromagnetic calorimeter operated by DOE’s Oak Ridge National Laboratory, to study—in the laboratory—conditions like those right after the Big Bang. Work on ALICE to date has inspired 405 student theses (completed or in process worldwide); U.S. doctorates number about 20. 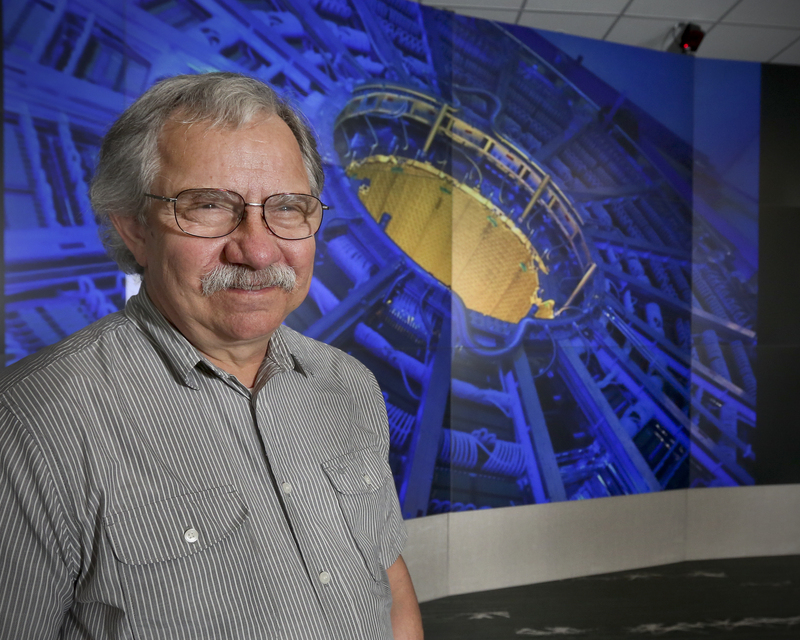 ORNL physicist Thomas M. Cormier leads the international group responsible for the calorimeter and the ongoing upgrade of ALICE’s time projection chamber for LHC’s third run. In 2013, he came to ORNL from Wayne State University, where he held a joint appointment at Lawrence Berkeley National Laboratory, to head the Large Hadron Collider Heavy Ion Group and lead the design, development and deployment of future U.S. instrumentation for ALICE. Here he provides an update on the experiment. Q: Is it pronounced AH-lus or ah-LEESE? A: Just about everywhere in the world they say ah-LEESE, but our research partners use an icon that’s clearly a picture of Lewis Carroll’s heroine, Alice from Wonderland. So I think it has to be pronounced AH-lus. Q: What are the roots of ALICE at ORNL? A: There have been simultaneous nuclear physics activities in several directions here. The big one for years, at the Holifield Radioactive Ion Beam Facility, focused on low-energy nuclear physics. Then physicists began accelerating high-energy heavy ions with accelerators originally designed for the study of elementary particle physics. As bigger accelerators were built, some physicists here at ORNL joined those programs. An early large synchrotron, the Bevatron machine at Berkeley Lab, began to accelerate heavy nuclei. Then came Brookhaven National Laboratory’s Alternating Gradient Synchrotron and CERN’s Super Proton Synchrotron. All these are fixed-target experiments. Then colliders appeared. First was the Relativistic Heavy Ion Collider at Brookhaven, then the Large Hadron Collider at CERN. There was a steady progression upward in the energy that could be reached. Today, the colliding beams in the LHC carry an impressive total energy comparable to a speeding bullet train—the French SNCF TGV Atlantique, for example, traveling at over 150 mph. Q: Does higher energy mean you can learn new physics? A: What happens when two heavy nuclei collide is quite different from what happens when two elementary objects, like protons, collide. Old elementary textbooks in nuclear physics used to describe nuclei as hard and super-dense matter—virtually impenetrable objects. When two nuclei collide at the energy of the LHC, however, you discover that nuclei are in fact quite penetrable and the matter is forced to overlap, almost like two objects occupying the same space at the same time. What results is a sample of matter that is 10 to 100 times denser than normal nuclei, composed of elementary objects known as quarks and gluons, and incredibly hot—over 100,000 times hotter than the center of the sun. It’s a small sample because we only started with two nuclei, but temperatures this high haven’t been seen in the universe since the first few microseconds after the Big Bang. After that few microseconds, the temperatures cooled and the quarks and gluons were gone, not to be seen again until we turned on these machines. That’s the basic object of study in this field—what is this sample of matter like that hasn’t existed for 14 billion years? What can we learn about it? What will it tell us about how the universe evolved from that very hot beginning? Q: Are you trying to learn how ancient particles might have created elements? A: That’s part of it. The constituents of nuclei—neutrons and protons—are built of quarks and gluons. Quarks and gluons are bound so tightly together inside nuclei that nowhere in the universe will you ever find a free quark wandering around today. The LHC collisions produce incredible temperatures that liberate quarks and gluons; they’re not bound to each other anymore. We produce a plasma, a liquid of free quarks and gluons. This is the nature of the matter that filled the universe for the first few microseconds. This field aims at learning about that plasma and this mechanism of confinement that holds things together in nuclei. Q: What force is responsible for confinement? A: The strong force results in the confinement of quarks and gluons. Quantum chromodynamics is the theory of the strong force. The name is cooked up to be analogous to quantum electrodynamics, which is the theory of the electromagnetic force. The force that you have between two ordinary objects—the electromagnetic force—depends on the charges of those objects (whether they’re positive or negative, big or small). Well, the strong force depends on charges between objects—but there’s not just one kind of charge. In the case of electricity, there’s positive and negative charge. But in the case of the strong force, there are six different kinds of charge. They go by three “color” names—pick your three favorites because they’re just arbitrary names—and their “anti-colors.” Those six charges also interact with one another, and all sorts of complications result. It turns out that quantum chromodynamics is a theory that can’t be fully evaluated numerically. Go to the biggest computers in the world, and you still can’t solve the full problem of quantum chromodynamics yet, in the same way you can solve a problem in quantum electrodynamics. That quantum electrodynamics problem is theoretically complete; we know how to solve it. But quantum chromodynamics’ progress is limited by the fact that it is a very complicated, non-linear theory, and even powerful computers only take us so far. Q: What do we know of the earliest universe? A: At its very beginning, there was nothing but quarks and gluons. They were free, in a liquid-like state, because they were so hot. Then the universe expanded and cooled. As it cooled to a few trillion degrees, roughly 100,000 times the core temperature of our Sun, neutrons and protons formed first. That happened a few microseconds into the universe. We had to wait much, much longer—minutes into the life of the universe—before neutrons and protons could begin to interact with each other and form heavier elements. This began once the universe cooled to about 1 billion degrees, roughly 50 times the core temperature of the Sun. Matter, mostly hydrogen and helium, began to collect together gravitationally and make stars. Then the stars started having their own nuclear reactions, cooking up the heavier elements. Q: ORNL led development of instrumentation critical to ALICE. What’s notable about these instruments? A: ORNL advanced instrumentation early on because it would reveal new physics. These are difficult experimental measurements because each collision produces more than 10,000 elementary particles. To track them all simultaneously is tremendously challenging. Up to five or six different kinds of measurements are made on every particle, and then folded together in a computer analysis. Lots of technical problems had to be solved as the field came along, and Oak Ridge contributed to a lot of that. ALICE’s electromagnetic calorimeter was built by ORNL in collaboration with other U.S. institutions. The detector was designed and produced by current ORNL team members. This instrument helps scientists understand the quark–gluon plasma. A quark or gluon can’t exist in nature as a free particle. When a gluon is bumped really hard in the collider, it can tear out of the quark–gluon plasma and turn into a jet of particles with a uniquely defined direction. When the gluon is in the plasma, it’s naked. But when it comes out into the world, we say it “dresses” itself. This phenomenon is one we use to diagnose what’s happening inside the quark–gluon plasma. Because this calorimeter came from the U.S. group, we take credit for providing this kind of physics uniquely to ALICE. Without the calorimeter, there’s no way to fully study these jets in ALICE. Q: What goes on inside the experiment? A: That depends on where a particle is. The biggest piece of the instrument is the time-projection chamber, roughly the size of a small school bus and full of special gas. The particles ionize this gas, and we are able to track the paths of the ions. This tracking information lets us count the particles, which is not trivial. The science begins to reveal itself in the time projection chamber. Why are there 7,000 particles this time but 10,000 particles last time (i.e., fluctuations in the number of particles)? Tracking information also measures fluctuations in the momentum distributions of particles—how many have high momentum, how many have low momentum. The particles pass through the time projection chamber pretty much unscathed. At the outer edges, the particles go through several other detector systems. First is the time of flight detector—an array that measures how long it takes particles to travel from the origin to their endpoint as they exit the time-projection chamber. That’s the velocity. Now, the curvature of a track tells the momentum, and the velocity tells the speed in a certain direction. If I know both the velocity and the momentum, I know the mass because mass equals momentum divided by velocity. The combination of the time projection chamber and the time of flight detector lets you know the mass of every one of these particles with some precision. The only other detector that also does that very well is the electromagnetic calorimeter. It can confirm, ‘Oh yeah! That was an electron big time!’ because the particle deposited all of its energy in it. This has to do with the fact that different kinds of particles entering the electromagnetic calorimeter deposit different fractions of their energy. Heavy particles—for example, protons and pions—have low energy deposition. Electrons deposit 100 percent of their energy in the calorimeter, and protons and pions typically deposit 10 percent or less of their energy. So there’s a very big difference. Q: Sounds like you’re generating big data. A: In fact, the upgrades we continually work on are aimed mostly at getting more data, to look at more and more subtle features of these collisions. ALICE produces a tremendous amount of data. In LHC Run 1, the experiment produced a few hundred million bytes of information per second. By Run 3, which will start in 2021, it will produce 3 terabytes of data per second. In very few seconds you produce more data than anybody has ever stored, from anything.